A sure-shootin' pedal that delivers straight-up distortion. 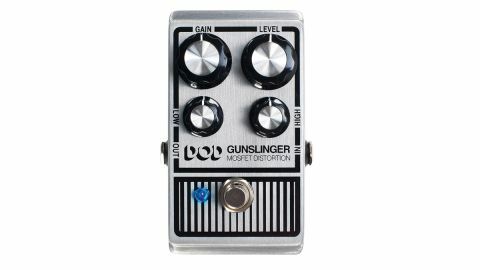 One of the first all-new DOD designs since the company's rebirth, the Gunslinger offers a more conventional distortion than the Boneshaker. Its MOSFET clipping provides a tight, snappy gain with a valve-like response, which yields big amp-like sounds with a bridge humbucker, coupled with a hefty serving of sustain for solos and grunt for rhythm playing. We aren't such big fans of the lower-gain tones, which seem to lose the punchy mids of the pedal's more distorted settings, but higher drive levels clean up nicely with your guitar's volume knob.